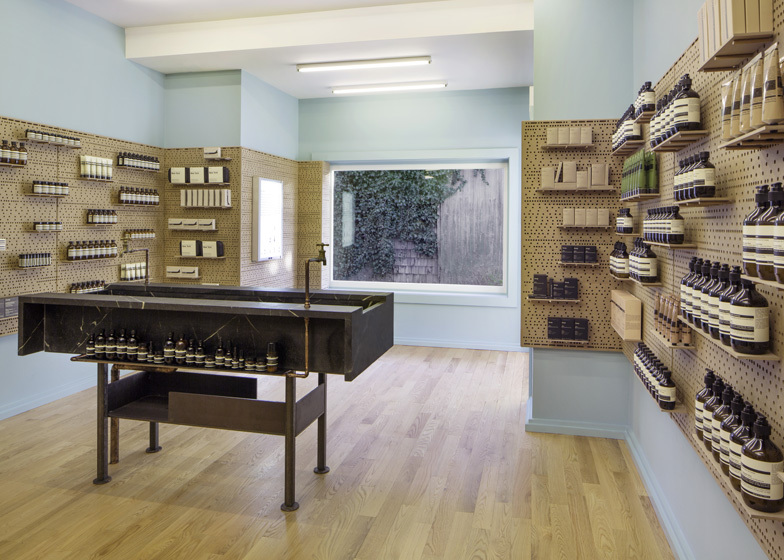 Shelves are supported by dowels slotted into pegboard walls at a new store for skin and haircare brand Aesop in the Hamptons, New York (+ slideshow). 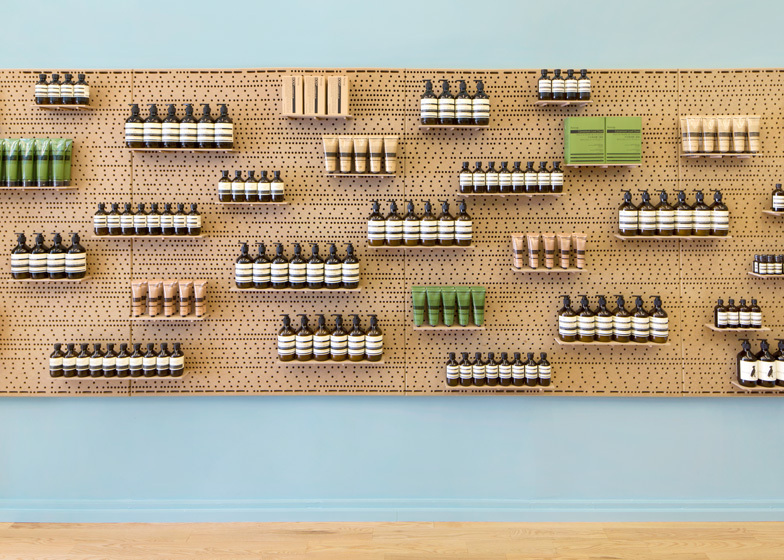 Designed and built by American studio NADAAA, who previously completed another Aesop shop in San Francisco, Aesop East Hampton has pegboard walls around three sides of its interior and a free-standing basin at its centre. Dowels of different sizes can be slotted into various places on the walls to change the arrangement of shelves for displaying the brand's signature brown-glass bottles. Walls above and below are painted in a pale shade of blue. The central sink - a key feature in Aesop's stores - is made from a Vermont soapstone that is typical in north-American bathrooms, while the taps are fixed to copper pipes. Dezeen previously interviewed brand founder Dennis Paphitis about how Aesop stores always feature unique designs. "I was horrified at the thought of a soulless chain," he said. Other Aesops featured on Dezeen include one in Tokyo made from the reclaimed materials of a demolished house and one in Paris with shelves made from hand-made iron nails. Aesops in the US include a New York kiosk made from over 1000 copies of the New York Times and a Boston store with shelves made from cornices. 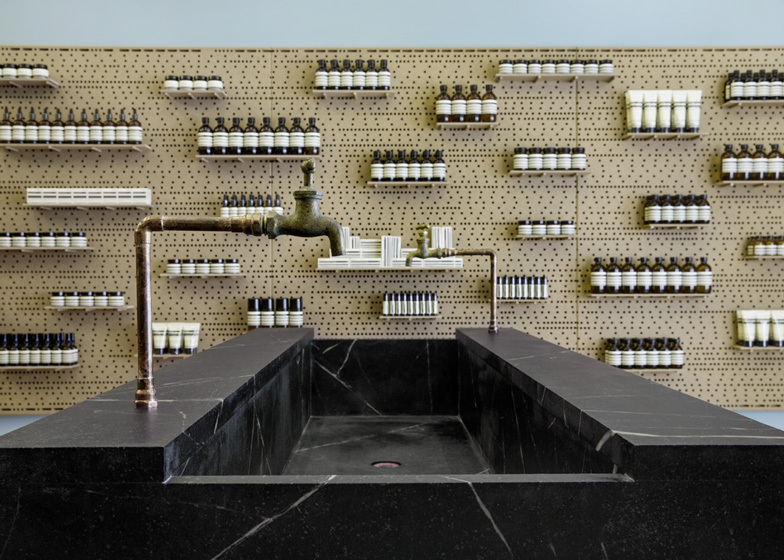 See more Aesop stores on Dezeen. 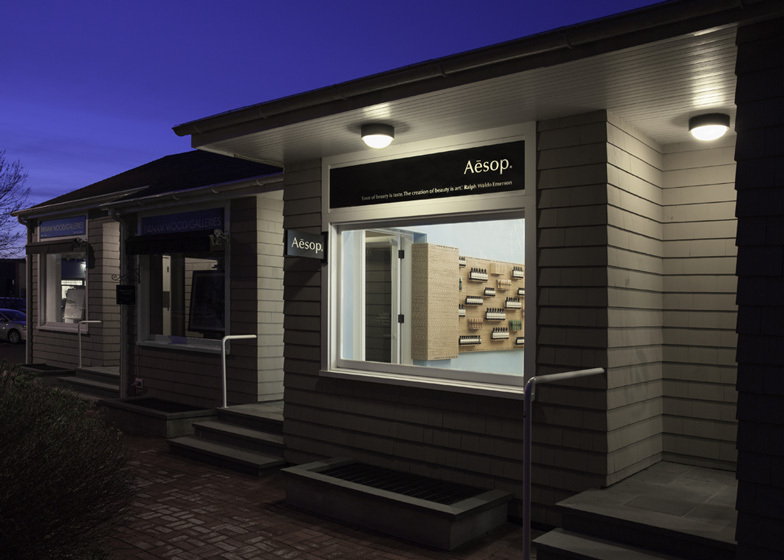 Aesop is pleased to announce the opening of a signature store in the Hamptons, and to take up residence in an area that has been home to many gifted creative spirits – Jackson Pollock, Lee Krasner, Willem de Kooning, Frank O'Hara and Jean Stafford among them. In recognition of the Hamptons' cultural and maritime heritage, Aesop East Hampton presents a tableau of practical and programmatic objects within a simple installation. Digitally fabricated pegboard panels line the walls, with dowels of varying lengths inserted to support orderly product display. A basin crafted from Vermont soapstone – a material long used for wash sinks in northeast United States – occupies the central space, with taps employing the simple copper valves often seen in the neighbourhood's carefully constructed gardens. A picture window opening onto the sidewalk allows for abundant natural light.